Are you on a diet after the excesses of the holidays? I sure am. Gwyneth Paltrow is by no means the first movie star to dish out advice on how to eat healthily, and drop some pounds along the way. Gloria Swanson raged against sugar in all its forms, Greta Garbo was bosom buddies with health-food guru Gaylord Hauser, and famously hearty eater Elizabeth Taylor wrote a legendary diet book called Elizabeth Takes Off in the 1980s. 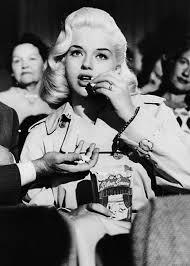 But when I’m feeling an excess of adipose tissue, it’s Diana Dors who I turn to. Diana was Britain’s answer to Marilyn Monroe. In the 1950s she was our ultimate blonde bombshell, possessing an hour-glass figure and dangerous curves, always used to full effect onscreen. Later in life, when her glory days were over, Diana found her weight ballooning and decided to take big steps to tackle it. In 1983, Diana announced that she was on a mission to lose 52 lbs. (25.5 kg) by her 52nd birthday, and the TV-am breakfast television broadcast was going to show her progress weekly. She would have moral support from the Dors Dozen, 12 ordinary mortals who would follow the same diet, all aiming to slim down following a calorie-controlled diet named the X-cel Diet. This all made for great TV. There was a weekly weigh-in slot, where Diana and one of the dozen would climb aboard a giant set of scales, familiar to Brits from swimming pools and fairgrounds. Much discussion was had about how easy the diet was to follow, and how great members of the Dors Dozen were feeling about losing weight. There was a weekly cooking spot, too, where TV-am would go into the homes of the dieters and film them demonstrating one of the recipes. Here, for example, is Mrs. Marilyn Mansfield making Apricot Chiffon and then serving it to guests in her family restaurant. For those of you interested in how food trends have changed over time, look no further than a gelatin-based diet dessert made in a loaf tin with tinned apricots on top. Dissolve the jelly in the boiling water. Drain the syrup or water from the apricots and add to the jelly to make it up to ½ pint (300ml). Chill until beginning to set. Reserve 5 apricot halves and chop the rest into quarters. Whisk the setting jelly until foamy, then whisk in the yogurt. Fold in the chopped apricots and turn it into a 450g (1 lb.) loaf tin. Chill until set. Turn out the chiffon onto a serving plate after dipping briefly in hot water. Slice thickly to serve. Serves 4. 1g fiber and 120 calories per serving. 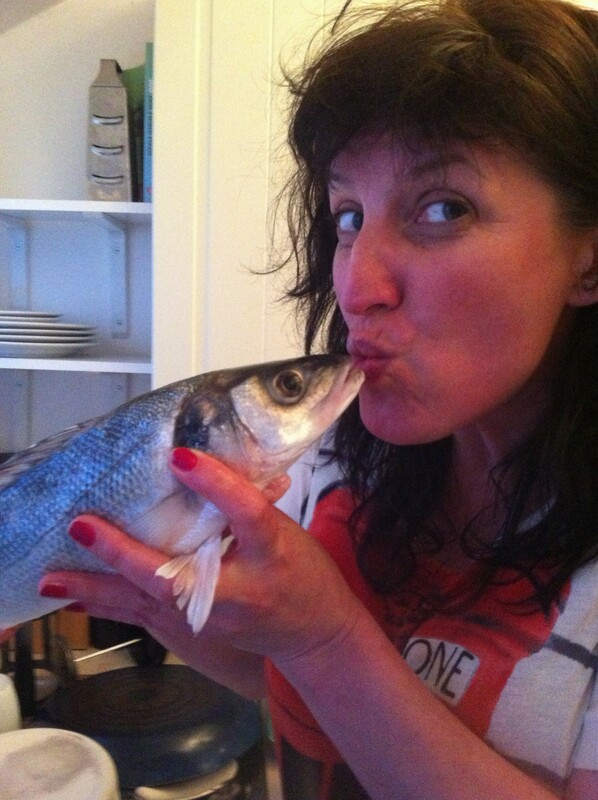 My favorite of the food demonstrations is one filmed in Diana Dors’ own kitchen. She demonstrates how to make a diet version of Chili Con Carne. It was great to see that Diana had a TV beside her breakfast bar, and like legendary American cook Julia Child, copper pans hanging on her wall. 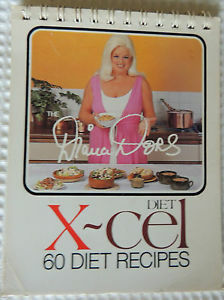 The diet proposed by Diana had its own recipe book, an exercise sheet and a motivational cassette tape. As she wrote in the introduction to the recipe book: “If you get depressed, or a little down, why not listen to the cassette – I will always be there.” Although apparently 13,000 of these kits were sold, I’ve only seen one X-cel Diet recipe book for sale on the Internet (I snapped it up), and have never yet seen one of the cassette tapes. Still looking. So here’s a recipe from the star’s X-Cel Diet: Diet with Diana. I love this because it’s like half a “full English breakfast” in one fluffy package! Beat the eggs with the water and salt and pepper to taste. Fry the bacon in a nonstick omelette pan until crispy. Add the egg mixture and, using a fork, stir the mixture over a high heat until almost cooked. When the omelette is almost set, spoon the beans on one side of it. Fold the remaining half over the beans to seal. Transfer to a warmed plate to serve. The recipe serves one, contains 4g of fiber and 240 calories. Happy dieting! Diana made it to her goal weight by her birthday. Here’s hoping that you make it to yours, too. Jenny Hammerton is a film archivist with a nosey parker interest in what the stars of Hollywood Golden era liked to eat and drink. She’s been scribbling away about film star recipes for around eight years at Silver Screen Suppers and her bulging collection of film star favorites now numbers over 5,500. When not cooking and writing, Jenny works with the British Movietone newsreel collection for the AP Archive in London, and DJs on a wind-up gramophone with The Shellac Sisters. You can read about and buy her new book Cooking with Joan Crawford here. 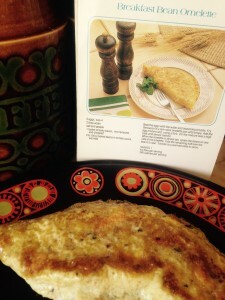 This entry was posted in Columnists, Eat, Eat: Recipes and tagged Diana Dors, Eat Like the Stars, Jenny Hammerton. Bookmark the permalink.